Heading into their visit to the Grange in June, England had been a rampaging outfit, having ascended to the No. 1 ranking in ODI cricket. No Associate had ever beaten a top-ranked country, and that history was reflected in Scotland's odds as 9 to 1 underdogs at the toss, according to most high-street bookmakers. But Scotland were confident and hungry. Two official ODI wins, over Zimbabwe and Afghanistan in the previous 12 months, their first ever over Full Members, proved their quality, but they were left stewing at having fallen short of qualification in March for a ten-team 2019 World Cup. 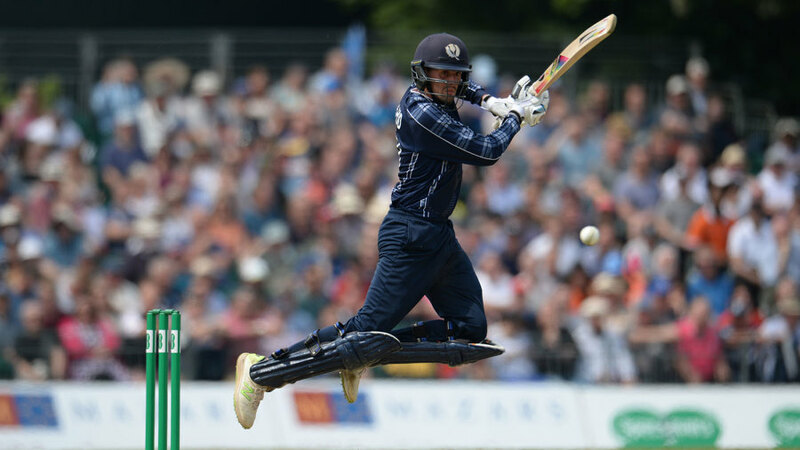 Despite his excellent personal form leading into the one-off encounter, Calum MacLeod had a point to prove, having made just 23 runs in three ODI innings against England. He spent the day putting his record right and by the time he got to three figures, off 70 balls, there were still six overs left in the innings. In other words, enough time to notch his fourth 140-plus ODI score and to lay the platform for a historic upset. MacLeod had dismantled No. 1-ranked ODI bowler Rashid Khan at the World Cup Qualifier in Zimbabwe just a few months earlier in making 157 not out, yet England kept Adil Rashid on for the start of his fourth over as MacLeod took guard. A few overs later Moeen Ali was brought into the attack from the opposite end. On a flat pitch offering little turn, the strategy backfired: MacLeod's first three boundaries were crunching sweeps against the England spin pair, allowing him to get his eye in with ease. Another slog-swept six off Moeen brought up his half-century, off 36 balls, and from there he rarely took his foot off the accelerator. 8 The number of batsmen who have made more 140-plus scores than MacLeod's four such scores in ODI cricket: David Warner, Virat Kohli, Sanath Jayasuriya, Chris Gayle, Sourav Ganguly, Hashim Amla, Rohit Sharma and Sachin Tendulkar. 107 The number of runs in the fourth-wicket stand between MacLeod and George Munsey, the highest partnership for any wicket by Scotland against England. Entering the day, the previous best was 89 by Kyle Coetzer and Gavin Hamilton, done twice, in 2008 and 2010. But MacLeod and Munsey had actually broken a new mark set earlier in the day by Coetzer and Matthew Cross, who put on 103 for the first wicket. "In Dubai just after Christmas, we shuffled things up a bit and challenged the players to take on some positions that they don't normally assume. He batted in the middle order and came in against spin and was encouraged to use his sweeps, which we know are fantastic shots for him, and tried to build that confidence in him." - Scotland coach Grant Bradburn on former opening bat MacLeod's prep for England. MacLeod was mainly competing with himself for the award. In this innings he defanged Asghar Afghan's vaunted spin trio of Rashid Khan, Mohammad Nabi and Mujeeb Ur Rahman in an emphatic win. With 51 runs needed off 47 balls and Nepal down to their final wicket, tailender Karan produced one of the most dramatic knocks in the history of ICC tournament play to send Nepal to the World Cup Qualifier.